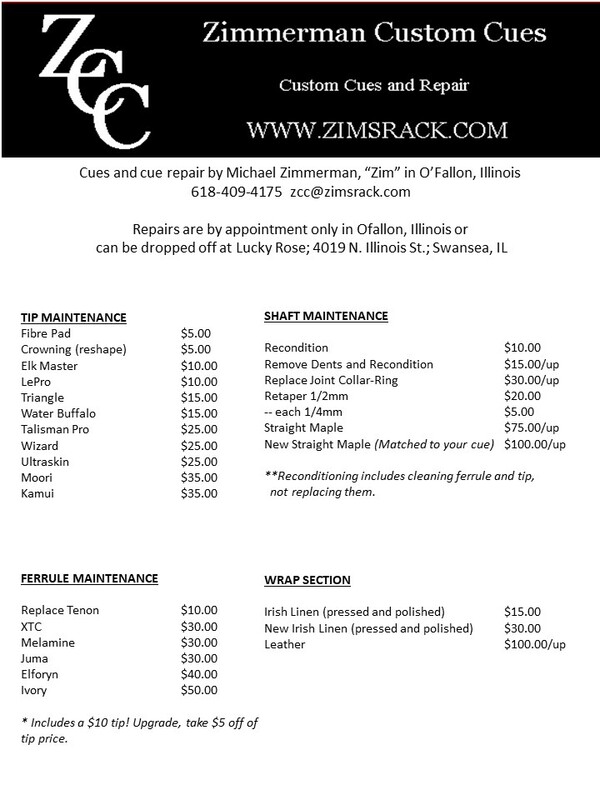 We offer custom cues and repairs by Cue Maker Michael Zimmerman, "Zim"
I started repairing cues in 2001 with a modified wood lathe and some tooling. I quickly realized I needed better equipment to get the job done more proficiently. I then purchased a Mid-Size Cuesmith lathe to do repairs and loved it. I later purchased a Deluxe Cue Smith lathe for building cues and later added a CNC Tapering Lathe. I now use all Taig based lathes and have several lathes and other equipment in my shop for building and repairing cues. In 2005 I was inducted into the International Cuemakers Association. In 2015 I was diagnosed with Lupus Disease and the symptoms from this restricted me from working on cues. 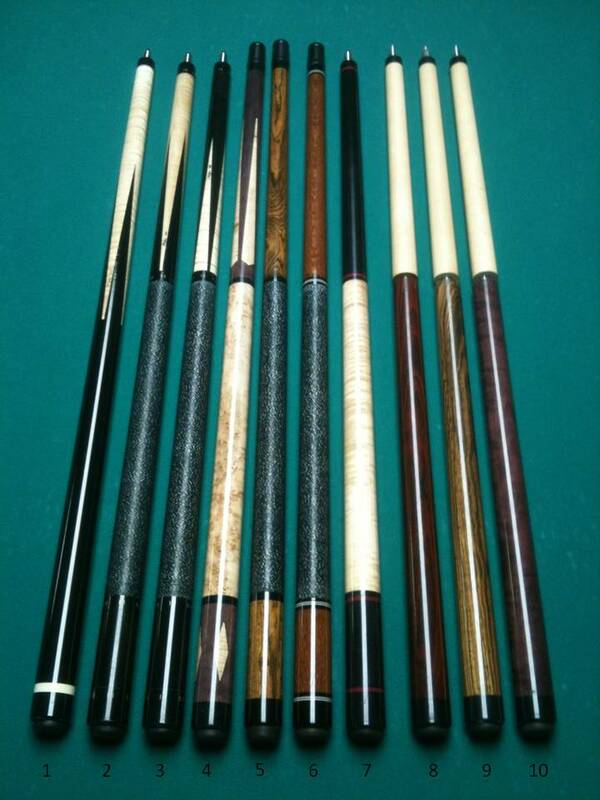 All my equipment was sold except the Deluxe Cue Smith, which allows me to still do all cue repairs needed. Contact me (email, phone) with a description of your cue design, I will generate a retail price for your cue based on your description and email it to you..
With the initial invoice you can modify your design if needed. If you are ready to order let me know and I will generate a purchase invoice. I will also provide an estimated time for delivery. I then ask for a 50% deposit to help with material costs. I accept PayPal, bank checks, money orders and personal checks (no materials ordered untill check has cleared). Your balance isn’t due until the cue is finished or you can make payments during the building process. If time permits, I will take photos of your cue(s) in progress and send them to you. When the cue is ready I’ll take more photos of it. Ordering a custom cue from our shop is a process that takes patience on the builders and the customer. Building cues is a passion, not a career- I do have a full time job and build cues part time. My goal is to build the best cue that I can for each of my customers. The process requires me to pay close attention to each part of the building process. It is all the little details that add up to what becomes a ZCC cue. I am very thankful for all of my past customers that have waited for my cues and for those future customers thinking of ordering a cue with me. * ALL cues come standard with phenolic joint collars, XTC ferrule, one straight grain maple shaft with a 13mm LePro tip. We do NOT use stainless steel joint collars! ** Add veneers, points, rings, leather wrap, additional shaft, and other options at additional charges. Minimum 3 months (up to a year) wait for custom orders. Below is a list of the cue models and their baseline prices. There are upgrade options such as leather wraps, inlays, ring work, extra shafts, etc. Copyright Zim's Rack. All rights reserved.